Do you take the time to write positive reviews? Or do you just review a place when they don’t meet your standards? Today peer recommendations seem to be what 90% of people rely on to make a purchase or visit an establishment (Watch this). How do they make the best of a situation when a friend doesn’t suggest an option? 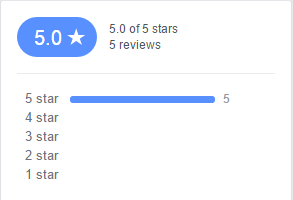 People look to reviews. Reviews tell readers the good and the bad. If the majority of reviews are positive and there is one lonely negative review, people will often discount the validity of the negative review. My suggestion would be to launch a campaign to increase your reviews on sites where people go to look for your business. Yelp is a huge player in this arena. Google+ for all of it’s faults is a major platform to make sure you have good reviews associated with your location on the map. 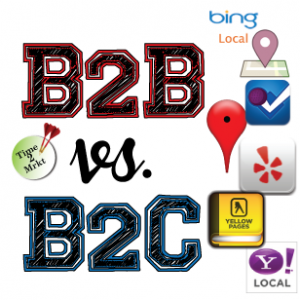 Bing and Yahoo both have similar functions with their mapping programs. What if you are a restaurant? Sites like Urbanspoon and others will help people make a decision about whether they choose your establishment or the one down the street. Are you in the home improvement business? Angie’s List is huge. Medical practitioners have similar sites as well. When I worked retail, years ago before computers and the internet, the adage was that if you provided great service a customer would tell 2 people. If it was poor, they would tell 10 people. Today with social media, that 10 people turns into millions in some cases. You cannot afford that. Negative reviews can be detrimental to your business. If they are not responded to in a timely manner they could be devastating. Make sure you are asking for your clients to provide positive reviews. The best time to do that is right after they express how satisfied they are with something you have just completed for them. Maybe you could even hold a contest to reward those who take the time to write a review for your business. Need to talk more about this opportunity? Give me a call! How can you take advantage of a Boolean Search? All of the major search engines like Google, Yahoo and Bing let you enter keywords you select to find the topics you are researching. This works the same way in LinkedIn and many other platforms. If someone doesn’t know your name, but enters the words for things you provide, will they find you? I do a great deal of work with job seekers. Since LinkedIn is my passion, it is only natural to spend time teaching job seekers how to make the most of their profile. One of the suggestions is to make sure that their profile is able to be found when the right string of keywords is entered into the search parameters. When teaching hands-on LinkedIn classes, I demonstrate how recruiters may enter six or seven keywords to limit the number of search results they obtain when seeking candidates. The goal the recruiter is seeking is 3-6 people who have all of recruiters keywords entered in their profile. You can use this same technique searching for a recruiter or a potential client. I recently found this article from Beyond.com about using the various Boolean search patterns. While this article was written for job seekers, it is transferable to business owners to understand how someone may find them when doing a search. I don’t want to start an entire discussion on SEO, but understanding how Boolean search works will help you make sure that the right keywords are listed on your various webpages and social media profiles. Please contact me if I can assist you with your LinkedIn personal or company profile. I am happy to consult with you in-person or through a webinar to help you optimize your LinkedIn or social media presence. As we near the end of this series of articles, our topic of this post is B2B vs B2C – Location Sites. This area of social marketing may not be 100% social media, but it is something that can play an important role in how our business is viewed and found! The platforms that I consider is this category include Yelp, Foursquare, Google Places (now Google+ with a Local business designation), directory listings, and all of the map sites – Bing, Google, Yahoo, and Mapquest (yes it is still in existence). Another consideration that may be included in this category is local or industry related sites. In construction for example, sites like Angie’s List, Houzz and Hometalk may be great sites for you. Do they have mini-web pages or business listings that could drive people through your door or to your website? One good example is my page on the Elgin Area Chamber website. While you may not have a storefront location that is open to the public, you still want to put your location on the maps. Grab your real estate! Add any links that go back to your website or social media. If you offer promotions, add them to your profile. If images are included in the platform, upload your limit. Make sure that all sections of a profile are complete using as many keywords as you can. You may not want to pay for an upgraded listing in the directories like Yellow pages or Dex, but at least make sure that your listing is correct. AND check frequently in case someone has written a review on your business. Since you don’t deal directly with consumers, this will be unlikely, but an unanswered review can be bad for business. Location sites are great for consumer based businesses. Reward people who “check-in” to your business. Use a contest format for people who write a review. Offer coupons and post images. Google Maps now offers an option of a 360 view of your establishment. Here is a link done by my friend and Google Certified photographer – Keith French. If you need one of these done for your Google Maps listing, tell Keith I sent you!! The advantage in this situation goes to the B2C business. That does not mean you should not take advantage of the listings even if you don’t entertain customers at your offices. No matter who you are, if you have a career path you are following, you need one thing in social media – a LinkedIn profile. When was the last time you searched Google, Bing or Yahoo for your name? If you do search your name, your LinkedIn profile will normally jump to the first spot in search results unless you have a website that is your name. Now having said that, if your profile is just there, not complete, not being used, it won’t help you much. BUT, if you are putting in the effort to show-up on LinkedIn, your profile can do wonders for you. 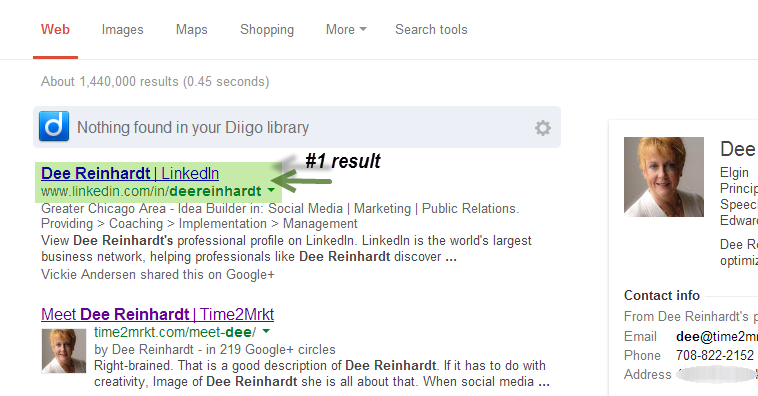 I just searched mine and my LinkedIn profile showed up #1 on all three major search engines. LinkedIn Company page – one of the best points about a company page on LinkedIn is that it validates you as a business. You must have a name@yourwebsite dot com email address to create a company page. You link your profile to your company profile, and voila, people see your company information in your personal profile AND they see your personal profile image linked to your company page. If you are a B2B business, I would suggest that you may want to enhance your company presence to the Nth degree on LinkedIn. Use all of the images and product spots available to you. Author DeeReinhardtPosted on October 15, 2013 October 14, 2013 Categories Small BusinessTags Bing, Google+, LinkedIn, search results, social media, Web search engine, Yahoo, Yelp, YouTubeLeave a comment on Where do you rank?